Despite low sale volumes and conversion rates, housing prices in Mumbai saw consistent rise. While in Jul-Sep 2014 and Oct-Dec 2014 the realty landscape grew by one and five per cent, respectively, it grew by two per cent in Jan-Mar 2015. Political upheaval and non-feasible development plans weighed heavily on the customer sentiments in Mumbai. The proposal for newer infrastructural developments, however, kept the market afloat and led to a rational growth in the first quarter of 2015. Maharashtra Government focussed on creating affordable housing in the city and announced plans to develop 11 lakh houses. The redevelopment wave continued to grip Mumbai. Most western and central suburbs witnessed fast redevelopment activities. However, the hike in premium for Floor Space Index (FSI) made these projects non-feasible for developers in many locations. In order to improve connectivity and reduce traffic woes between South Mumbai and the Western Suburbs, a coastal road was proposed which may get the environmental clearance soon. The Government planned to develop 30 towns as ‘Smart Cities’ in Maharashtra. One of those planned in Mumbai is Navi Mumbai Airport Influence Notified Area (NAINA), which will span across 600 sq km around Navi Mumbai International Airport. Like several other cities such as Delhi and Bangalore, Mumbai also faced the problem of unsold inventory leading to reduced number of new launches. As per a report by Liases Foras, there are close to 1.6 lakh units unsold in Mumbai Metropolitan Area (MMR) alone. 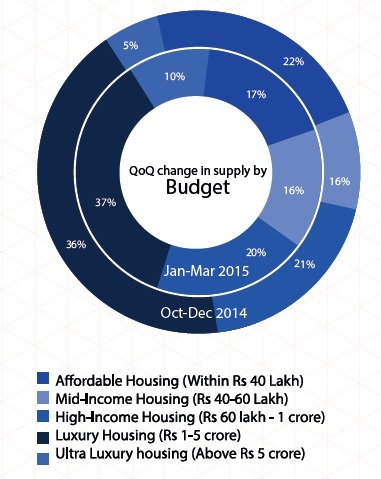 On the supply front, smaller residential apartments of 1-2BHK configuration continued to be the most supplied units. This was in line with demand, specifically due to the high ticket price in the city. While Sakinaka recorded a significant drop in the previous quarter, it emerged as one of the top grossers in Jan-Mar 2015. The upcoming Times Square Commercial Complex and improved connectivity due to the elevated metro line worked in favour of the locality. With several new residential projects under development, Wadala recorded a nine per cent price rise. Its anticipated development as a ‘smart city’ and its planned connectivity by the monorail also acted as growth catalysts. High land and construction cost hiked property prices in localities such as Yari Road, Borivali West and Khar West. Chembur benefitted from the growing commercial establishments and its affordability as compared to the uber-expensive South Mumbai. Property prices in Chembur are 30-35 per cent lower than those in South Mumbai locations such as Mahalaxmi and Lower Parel. Despite offering seamless approach to the airport and Western Express Highway, Vile Parle East recorded a significant drop of seven per cent. Housing demand from this locality shifted to Andheri East, located 3km away, where properties were available at much lower prices. 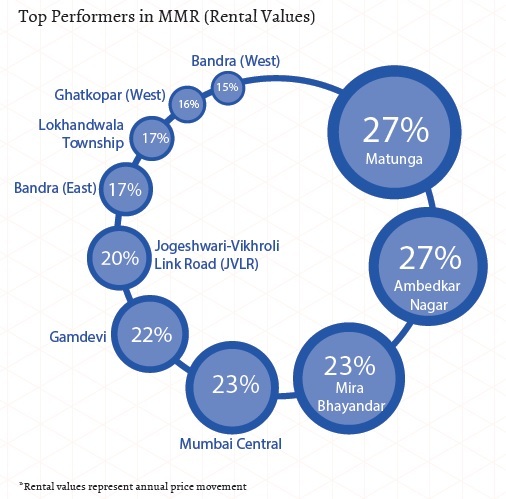 Matunga and Ambedkar Nagar emerged as the top grossers in terms of rental values. Both the localities registered a hike of 27 per cent in the last one year. With Matunga located around Prabhadevi and Ambedkar Nagar around Kalina and Pali Hill, both the locations saw a rise in demand for rental housing due to comparative affordability from these premium residential addresses. Presence of several educational institutions in Matunga also fuelled rental demand. Hunt for affordable homes drove home seekers to Mira Bhayandar and Mira Road where rental rates rose by 15-23 per cent. Amongst the premium localities, Gamdevi and Bandra East recorded the maximum price rise of 17-22 per cent. Proximity to commercial spaces and availability of rental options continued to keep the rental demand robust in most western suburbs. Localities such as Kandivali West, Borivali East and Malad East recorded a rise in rental rates by 14-16 per cent. Ghatkopar West recorded a healthy rental demand from the workforce of Chembur and Bandra-Kurla Complex. Connectivity by metro has been a major growth stimulator for rental rates in the locality. 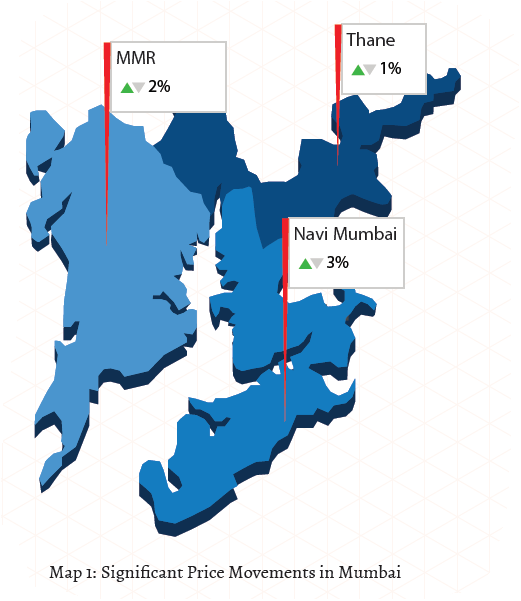 Amongst all regions in Mumbai, Navi Mumbai recorded the fastest growth of three per cent. With several infrastructural projects being planned along with development of Special Economic Zones (SEZs) on the cards, the region is on a growth trajectory. Karanjade emerged as the top performer in Jan-Mar 2015 with nine per cent surge in prices. With the upcoming metro in Khandeshwar, 8 km away from Karanjade, the locality has been recognised as a growth corridor. Property prices in Taloja, Taloja Panchanand, Kharghar and Khandeshwar appreciated by six to eight per cent due to Navi Mumbai metro. Housing multiple SEZs with IT/ITeS office spaces, Ulwe continued to record high housing demand. Located about 5km away from Kharghar, Roadpali attracted buyers due to affordable housing options. The locality is in proximity to Vashi, Belapur and MIDC Taloja. Only three localities recorded a drop in prices, namely, Shilphata (nine per cent), New Panvel (four per cent) and Kamothe (two per cent). Located at the farther nodes of Navi Mumbai, all there areas saw demand spilling over to areas which are to witness metro connectivity soon. With well-developed social infrastructure and proximity to the major commercial hubs of Navi Mumbai, Nerul has been a preferred rental destination. In the last one year, the average rental rates for a standard 3BHK apartment have gone up from Rs 30,000 to Rs 40,000 per month. Planned connectivity by the Navi Mumbai metro in its Line III is a major factor fuelling residential demand here. Vashi, Sanpada and Palm Road are too planned on the same metro line as Nerul. The growing demand has reflected in their rental rates as well. While Sanpada recorded an annual spike of nine per cent, Palm Road witnessed an eight per cent hike and Vashi saw a rise of four per cent in Jan-Mar 2015. Presence of business district in Belapur kept housing demand high. The upcoming metro resulted in an overall increase in the rental values by five per cent. Other localities which recorded a double digit growth were Ghansoli and Airoli (16-18 per cent). With comparatively easy access to Thane, both the localities garnered housing demand from both Navi Mumbai and Thane. 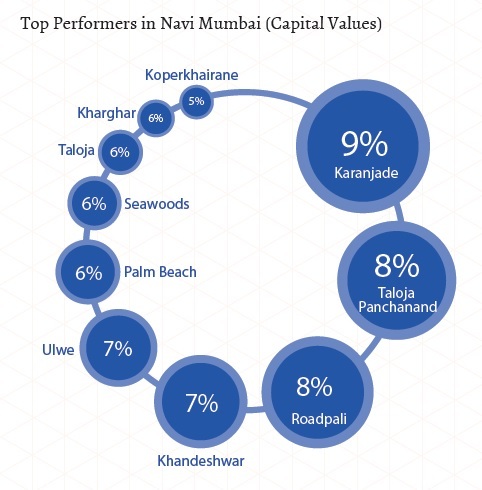 While Kamothe recorded an 11 per cent spike in rental rates, Panvel saw stable values due to oversupply and distance from the main city. With almost 60 per cent localities recording a hike in property prices, Thane registered an overall growth of one per cent in Jan-Mar 2015. The Thane metro, planned to connect Wadala and Ghodhbunder Road, played a major role in propelling property prices. Adharwadi in Kalyan recorded a price rise of 13 per cent. Kalyan West saw prices increasing by five per cent. The area garnered more interest from homebuyers due to increasing number of SEZs and offices in the region. Adharwadi, however, performed better than Kalyan West owing to its comparatively affordable properties. Bhiwandi continued to be a front runner in Thane, with a nine per cent price hike. Low ticket size, good connectivity and ample job opportunities kept housing demand robust. The area has several projects slated for possession in the next three years. Far off locales beyond Thane, such as Titwala, Vasind, Khopoli and Neral recorded moderate rise in prices to the tune of four to nine per cent. Affordable property prices attracted investors here from both Mumbai and Pune. 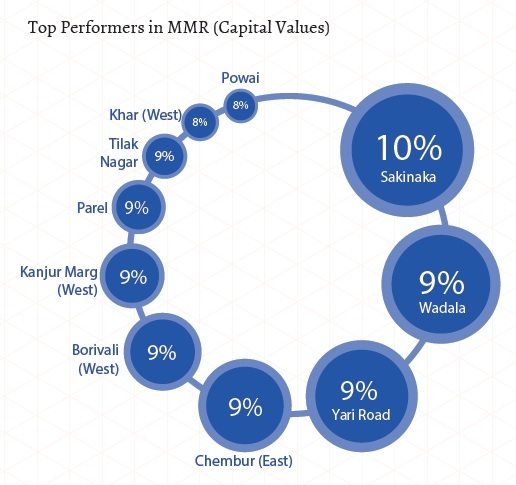 Vasant Vihar and Pokhran Road emerged as the top non-performers due to demand slipping to affordable areas. Prices here dropped by seven to eight per cent. 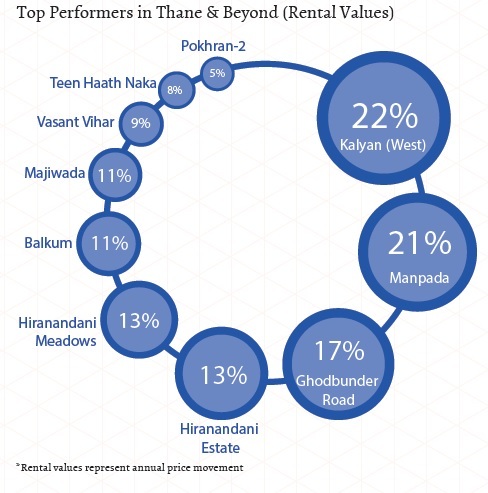 The rental market performed well in Thane in the last one year due to its comparative price feasibility to MMR. The planned Thane Metro directly impacted customer sentiments and pushed rental rates here by an average of 11 per cent since Jan-Mar 2014. 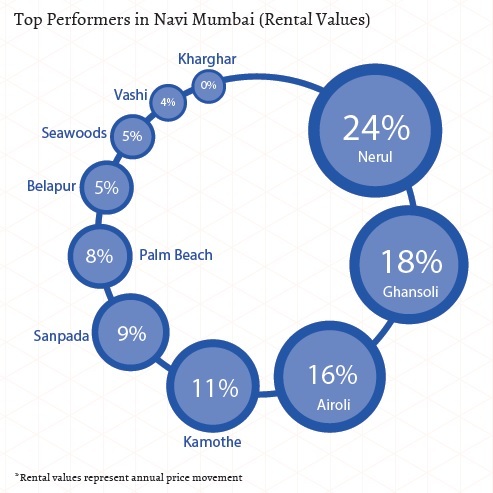 The front runner in the race of rental performance was Kalyan West with a 22 per cent yearly hike. Well-developed social infrastructure, easy connectivity by road and rail and proximity to industrial zones of both Thane and areas beyond Thane attracted several home seekers to this locality. Those who frequently travel between Mumbai, Navi Mumbai and Thane preferred staying at central locations such as Ghodbunder Road, Manpada, Majiwada and Vasant Vihar. While rental values in Manpada went up by 21 per cent, those on Ghodbunder Road went up by 17 per cent. Majiwada and Vasant Vihar recorded a price hike between nine to 11 per cent. Even luxurious townships such as Hiranandani Estate and Hiranandani Meadows on Ghodbunder Road recorded an increase in rental rates to the tune of 13 per cent each. Located further towards MMR, Teen Haath Naka attracted home seekers wanting to stay closer to Dadar, Chembur and Bandra-Kurla Complex at reasonable prices. Being one of the most expensive real estate markets of India, Mumbai saw maximum supply of small and mid-sized homes configured as 1BHK or 2BHK units. Multi-storey apartments remained the most popular choice due to their price feasibility. Across regions, maximum supply was noted for multi-storey apartments, similar to the previous quarter. This property type made up almost the entire market with 97 per cent share. Its supply remained stagnant between Oct- Dec 2014 and Jan-Mar 2015. Mumbai recorded more supply of independent houses/ villas and builder floors as compared to Navi Mumbai and Thane. Being newer areas of development, both Navi Mumbai and Thane catered to the dominant housing demand of residential apartments. Majority supply of independent houses/villas in Mumbai was recorded in ultra-luxurious locations of South Mumbai and areas where redevelopment was a robust trend. Similar to the previous quarter, luxury housing category (Rs 1-5 crore) recorded maximum supply in the city (37 per cent). Mumbai and Thane recorded more than 40 per cent supply in this budget category. Navi Mumbai had a considerably smaller share of luxury housing (16 per cent). The high-income housing category (Rs 60 lakh–Rs 1 crore) saw the second highest supply (20 per cent) in the city. Navi Mumbai and Thane had the majority supply in this category. While in Navi Mumbai, this budget range made up 28 per cent of the market share, in Thane it captured 36 per cent of the realty landscape. Mumbai had only 15 per cent properties available in this price. The mid-income housing segment (Rs 40-60 lakh) and the affordable housing segment (up to Rs 40 lakh) witnessed an almost equal supply of 16-17 per cent in the city. Maximum supply of mid-income inventory was seen in Navi Mumbai, followed by Thane. In the affordable price bracket (up to Rs 40 lakh), Navi Mumbai emerged as the front runner with almost one-third of its total properties available in this budget. Surprisingly, Mumbai also recorded a healthy supply of 22 per cent for affordable properties. The ultra-luxury housing category (above Rs 5 crore) found its entire market in Mumbai. 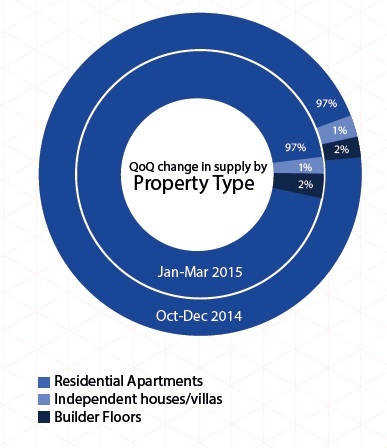 Despite a considerable hike in supply, these properties remained the least supplied in the city owing to less takers. The budget category of Rs 1-2 crore registered a dip in new launches as the number of under-construction homes in this bracket went down by almost six per cent. 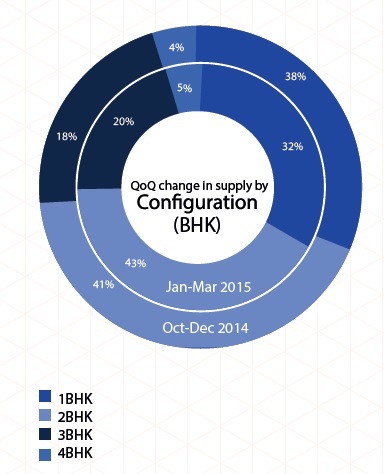 As in Oct-Dec 2014, 2BHK units recorded maximum supply to the tune of 43 per cent in Jan-Mar 2015. Availability of these units increased slightly since the previous quarter. All three regions – Mumbai, Navi Mumbai and Thane saw maximum supply of 2BHK apartments in their respective markets. While Navi Mumbai had close to 47 per cent units configured as 2BHK apartments, Thane had 44 per cent units in this category. Mumbai had about 38 per cent properties configured as 2BHK units. However, the region saw an almost equal supply of 1BHK apartments (37 per cent) as well. The overall share of smaller homes of 1BHK configuration was 32 per cent, six per cent lower than the previous quarter. Navi Mumbai had maximum 1BHK units to offer (42 per cent), followed by Mumbai. Supply of larger homes with 3 and 4BHK configurations went up by four per cent in the current quarter. 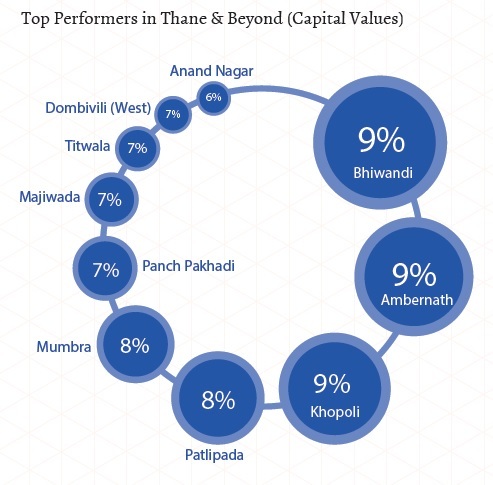 Thane and Mumbai had an equal share of 3BHK units in their respective markets (20 per cent each). Whereas, Navi Mumbai had about 10 per cent of its total properties configured as 3BHK units. In case of 4BHK apartments, Mumbai outperformed Navi Mumbai and Thane and offered five per cent of its total properties in this configuration. 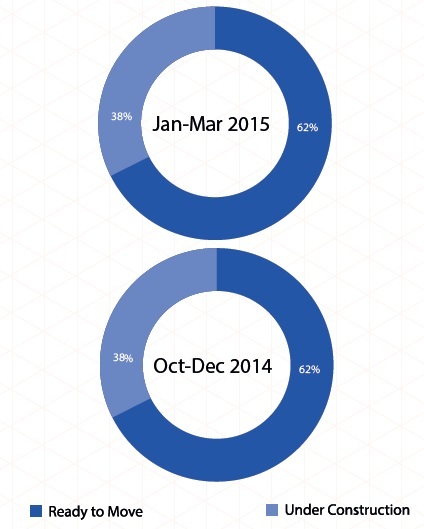 In Jan-Mar 2015, close to 60 per cent of the city’s total share of properties available on sale were ready-to-move-in. Navi Mumbai and Thane housed the maximum properties, about 63-64 per cent, available in the ready-to-move-in category. Mumbai had the lowest share of ready-to-move-in properties, i.e. 57 per cent of its total market share. Despite lack of new land parcels, robust redevelopment activities kept the share of under-construction properties high in the financial capital. About 43 per cent properties in Mumbai were under-construction, whereas, in Navi Mumbai and Thane, 36- 37 per cent properties were under-construction.